Sister Marie Cecile Reardon, I.H.M. 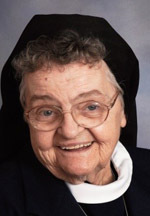 Sister Marie Cecile Reardon, I.H.M., 89, died June 17 in Camilla Hall, Immaculata, in the 69th year of her religious life. Born in Philadelphia, she entered the Congregation of the Sisters, Servants of the Immaculate Heart of Mary in 1947 from St. Francis de Sales Parish, Philadelphia, and professed her vows in 1950. Sister Marie Cecile taught in the elementary grades in the Archdiocese of Philadelphia and the Dioceses of Allentown and Arlington. She was assigned to Camilla Hall in 1999. The funeral Mass was celebrated in Camilla Hall on Thursday, June 23. Father William E. Dean was the celebrant and homilist. Sister Marie Cecile is survived by members of her I.H.M. community and by her cousin, Jean Furey and her many friends. She was predeceased by her parents, Cornelius J. and Mary Cecilia Gillespie Reardon and her sister, Rita Chastail.